How long can native English speakers chat without using at least some common phrasal verbs? Not very long—they’re a major part of most casual conversations. So they’re important for any English learner who wants to talk with (or just listen to) native English speakers. Because many phrasal verbs are not just the sum of their parts, it helps to study them—-preferably a few at a time-- rather than just guess their meanings in context. It also helps students to get a short explanation of separable and inseparable phrasal verbs if they will want to use them in conversations themselves. This can be a tricky grammar point and requires some memorization or a lot of listening. There is, however, a short cut: It’s always safe to use the phrasal verb followed by a noun. (i.e. 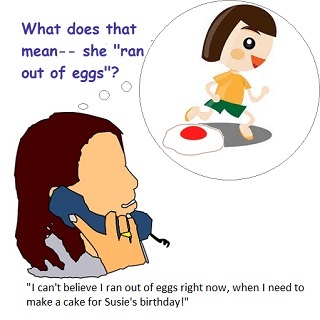 ‘She got into the car’ or ‘he called off the deal,’ rather than ‘she got into it’ or ‘he called it off.’) The complications come in trying to decide whether a PRONOUN goes between verb and participle or after both. One other simple memory trick: any phrasal verb with more than two words (get along with, be up to, cut back on, run out of...) will be inseparable. If you’re studying English on your own, especially try the memory games. You can play them as a form of Solitaire, and keep track of the time you need to match them. Try to beat your best previous time. I finally finished an inexpensive packet for teaching phrasal verbs in ESL classrooms. It includes 7 mini-lessons (20 minutes to 1/2 hour) with explanations, examples, and practice for just under 100 phrasal verbs total. It introduces 12-13 new phrasal verbs a day for most days, and gives extensive review activities for about half of them, with memory games to practice 32. Check it out at Common Phrasal Verbs. For even more phrasal verbs, see English Club’s Phrasal Verbs List (about 200) or their list of 2000, linked from it. I’m curious. Do you already teach phrasal verbs (or if you’re learning English, have you already studied them?) You can just reply to this email with a ‘yes’ or ‘no...’ Thanks!